Ample Hills Creamery was founded by husband-and-wife Brian Smith and Jackie Cuscuna in 2011 in Prospect Heights, Brooklyn. Ample Hills’ goal is to invite people to celebrate and engage in the story of ice cream through their playful, fun and inspiring flavors, their vibrant, caring and creative Amployees, and their experiential classes, hands-on demonstrations and birthday parties. Today, the company operates six locations in New York City; sells pints directly to customers nationwide online; and is rated "#1 Ice Cream in NYC" by Zagat, named "Best Ice Cream in America" by Food Network, and chosen as "#1 Ice Cream Flavor in America" (The Munchies) by The Huffington Post. Ample Hills Creamery is known for its experiential birthday parties, but now you don’t need to wait for your birthday to celebrate. Join us for a special Valentine's themed Ice Cream Social. Spend this special night surrounded by love with like-minded ice cream lovers. You’ll make a special flavor ice cream the old-fashioned way, taking turns riding our ice cream bicycle, churning with pedal-power! While the ice cream hardens we’ll get crafty, designing an ice cream-themed project. And as you get limber and creative we will test your ice cream knowledge with a tricky game of trivia. Last but not least, our finished ice cream is the basis for a brownie sundae bar with toppings galore! 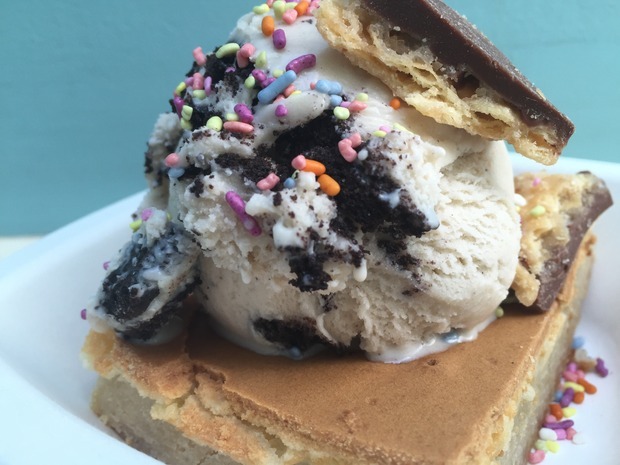 Each ticket gets you access to this 2.5-hour ice cream extravaganza. Round up your friends and indulge your kid-at-heart with pizza, a craft project and a sundae bar. If you'd like to sit with friends who are also attending, please be sure to sign up together as one group so we can plan the seating arrangement for the evening. Please note this event is a party rather than a workshop; check here for ice cream making classes at Ample Hills.